My hubby is a huge baseball fan. He has his favorite teams (yes he has more than one) but it goes beyond that. He’s a fan of the sport in general, and gladly welcomes any chance to see a live game no matter who is playing. Well, almost. There is one team in particular that he likes to see lose, but that’s another story. He has hats from every ballpark we’ve ever visited, so he can wear any team colors at any moment. You’ll often find him sporting an Orioles hat, a Texas Rangers jersey, and Boston Red Sox shorts. That’s an outfit appropriate for any sporting occasion. Since it was his birthday Saturday, I planned a baseball day for him as his present. I’ve done it before, because he loves doing it and because it’s one of our life goals to visit every major league ballpark as a couple. The older we get,the more I think we need to focus on that goal before we run out of steam. I always take pictures to document the visit. Let’s face it, after you visit a lot of ballparks they all start to blur together. Pictures really help. So a cheer for Janet Marie Smith, for sticking to her guns and getting it right. All except one thing. I don’t think she sat in the seats when she designed this thing. Or rather, I don’t think she had a normal sized man sit in them, and she definitely didn’t have any tall men try them out. 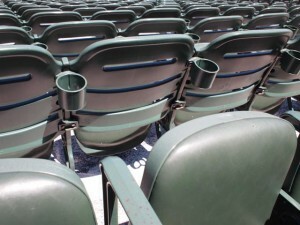 These seats, or rather, the rows of them, are clearly designed for smaller people. I’m short (5’3″) and after I sat down my knees were, at most, 3 inches away from the back of the seat in front of me. Have I mentioned my hubby is tall? He’s 6’3″. Most of his height is in his upper body but still, you don’t get to be that tall without long legs. He tried to sit, and immediately got back up. Surveyed the seat and the surrounding area. Then tried again, very, very slowly. It was like watching sardines get shoved into that tiny tin can, or a Great Dane squeeze into a tiny bucket for a bath. It’s not the width of the seat that’s the problem. It’s the leg room. Picture the last flight you took. You’re sitting in the middle seat. You’re in coach. Not the front of coach. Not on the airline with “more leg room,” and definitely not in the “Extra Special Two Extra Inches of Space” part of the plane. You’re in the back, in the middle, next to the toilet. Now that your knees are crammed in and your arms are wedged firmly to your side, take away about 3 inches of leg space. While it doesn’t affect me…like I said, I’m short….hubby had his knees shoved so hard into the back of the seat in front of him that his knee caps nearly dislocated. He had to tuck his feet under sideways to even be able to sit down. When an exciting play happened, he was the last to stand because you can’t just hop up from that sort of wedgie. Then he’d go through the process all over again…lower slowly into the chair, while tucking one foot under, getting the knee wedged up against the cup holder, then lowering further to wedge the other knee in, then finish sitting and sit perfectly straight up with arms in the air (or around my shoulder ,or across the guy’s lap behind us). If you practice yoga, you could probably make it work. Hubby is not the yoga type. He came home with bruised knees and sore ankles. But he swears he enjoyed it. Probably because the Orioles won (it might have more to do with the team that lost *cough* Yankees *cough*). I love Camden Yards. I love the whole area. It’s fun to go early and walk around the Inner Harbor. If you don’t like crowds, you might not enjoy it, but otherwise it’s a great place to hang out before the game. Well, that is if the temperature isn’t Humid and Horrible. Which is was. We spent a lot of quality time in Cheesecake Factory, who sang Happy Birthday to the hubby and made him blush. It was worth the heat stroke just for that. Camden Yards itself is beyond cool. It’s classy, elegant, throw-back style awesome. 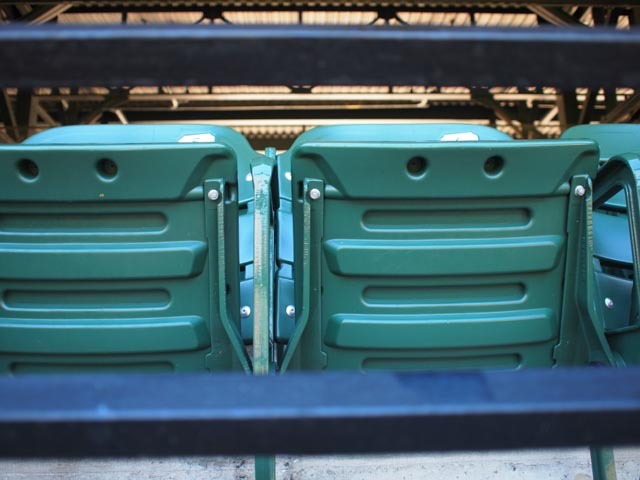 Except for those seats. Our next game is the Washington Nationals. I’ll be sure to report back on the leg room situation. What about you? 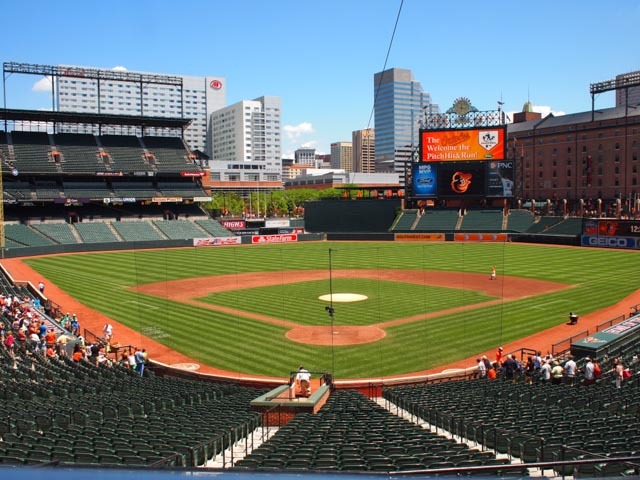 Have you been to Camden Yards? Are you tall? How did you manage?